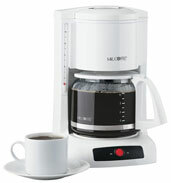 Looking for Coffee Maker ? Coffee maker is a kitchen appliance for brewing coffee automatically without having to boil water in a separate container. While there are many different types of coffee makers using a number of different brewing principles In the most common devices, coffee grounds are placed in a paper or metal filter inside a funnel, which is set over a glass or ceramic coffee pot. Cold water is poured into a separate chamber, which is then heated up to the boiling point, and directed into the funnel. This is also called automatic drip-brew. Kaldi, a sheep herder from Caffa, Ethiopia discovered the coffee. There is a very interesting story related to it. Kaldi, while herding his sheep, happened to notice that his sheep would get hyperactive after eating red Ã¢â¬ÅcherriesÃ¢â¬Â from the plant we now know to be coffee. Intrigued as to what the plant was doing to his flock, Kaldi tried a those himself, and was soon in a caffeine frenzy. Initially, the local monks scolded Kaldi for his new-found drug, but they soon found that if they took some coffee themselves, they could stay up later for their prayers. But until 1453 coffee was consumed mostly as beans. 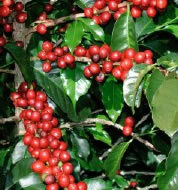 Originally the coffee plant grew naturally in Ethopia, and later, the Arabians took it to their land, farmed it heavily, and began the first coffee monopoly. In 1453, the Turks were the first people to make a drink out of coffee beans, and the worldÃ¢â¬â¢s first coffee shop, Kiva Han, opened there 22 years later. Soon coffee became a common drink all over the world. 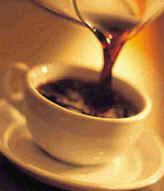 Before the coffee maker was invented, coffee was prepared in boiling water. The beans were roasted on an open fire and then added to boiling water for consumption. This process did not bring the desired taste and aroma, and hence coffee lovers started to devise ways to come up with a machine or a coffee maker that would prepare tasty coffee. Turkish Ibrik in 578 AD: The Turks is a innovative type of coffee maker to brew coffee by heating the maker in desert sand. This was named as the Turkish Ibrik. Perfection of French Drip Pot in 1800: The French Drip Pot wasn't originally a coffee maker, but Count Rumford, an eccentric American adventurer of Paris perfected it to a type of coffee maker. Percolator Type Coffee Maker in 1818: The year 1818 in Paris witnessed the invention of the first coffee maker by Laurens, a Parisian metal smith. Designed in the percolator type, it came to be used widely by American frontiersmen who termed it as the 'Cowboy pot'. The exclusive design, simple operational process and durability has made it popular till today. Deemed as an antique coffee maker item, each of the earliest brands is priced over ten thousand dollars at antique auctions. 1835-1850, The Golden Age of Coffee: The year from 1835 to 1850 has been termed 'The Golden Age of Coffee' with the invention of various coffee makers and related parts like pressure steamers, glass balloons, vacuum or piston coffeemakers, pneumatic pump, the Napierian balancing siphon, locomotive coffee makers, grinders and roasters. Double-glass-blown Cafetiere in 1894: The year 1894 witness yet another invention of the coffee maker called double-glass-blown cafetiere . Melitta Coffee Filter Paper in 1912: Earlier, for the filtering purpose of coffee, linen or cloth was used. Frau Benz invented the Melitta coffee filter paper in 1912, which is an efficient disposal method for coffee. General: Over the next one hundred and fifty years the percolator based coffee pots were developed with newer features. These products became popular in many homes and restaurants. Espresso Coffee Machine in 1946: Achille Gaggia invented the espresso coffee machine to work without steam. 1960's--Modern Filter Type Coffee Maker: A new and innovative coffee maker was invented in the 1960s called filter type coffee maker, which has more advanced features than the earlier varieties. Developed more with the passage of time, this new design came to be manufactured by many companies and its demand rose in the market. 2004--Introduction of the FT and IS series. An espresso coffee drink gives more energy and it is tastier than the other coffee drinks. The first espresso maker was invented by a manufacturing company owned by Lugia Bezzer in 1901 in Italy. Mr. Bezzer was simply looking for a way to help speed up his employeeÃ¢â¬â¢s coffee breaks. He figured out that if pressure was applied in the brewing process, the drink could be made in a lot less time. Nicknamed Ã¢â¬ÅThe fast coffee machineÃ¢â¬Â, the espresso machine patent was sold in 1905. The new owner, Desidero Pavoni developed an espresso machine that used a piston pump to force water through a tube and into the coffee. The commercial espresso machine was invented in 1946. Since then, the espresso maker under different brands began to be produced by many companies. Some of the prominent brands include Juda, Mr.Coffee, Kitchenaid and Braun. 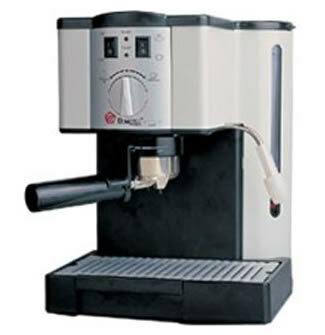 The modern espresso machine come in various features, styles, colors and prices. Combination of both Grinder and Coffee Making Capabilities. People drinking 2-3 cups every day were 40% less likely to develop painful gallstones.